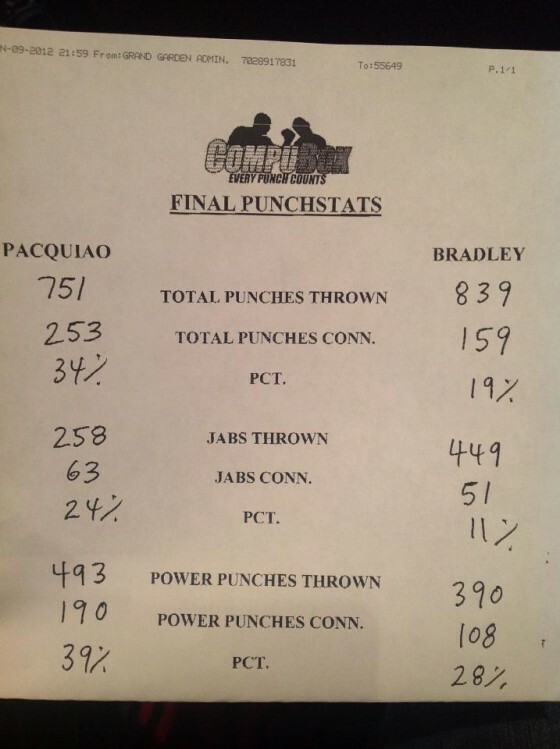 Manny Pacquiao lost a bizarre split decision to Timothy Bradley in Las Vegas tonight, in a fight that saw Pacquiao never in trouble and never threatened and in which Pacquiao led comfortably on Compubox figures in all categories–punches landed, power punches, and connect percentage. I just finished watching the fight a second time with the commentary turned off. This time, giving Bradley every round he seemed to have a possible chance of winning, I ended up 8-4 for Pacquiao — or 116-112 Pacquiao. There are no highlights for Bradley — he landed at most a half dozen punches that would even show up as being clean power punches that moved Manny’s head at all. Nothing at all like Marquez III, where you could see Marquez repeatedly hitting Pacquiao with punches that snapped his head back. For those who didn’t see the broadcast on HBO — Harold Lederman had it 119-111 for Pacquiao, giving him 11 of 12 rounds. Jim Lampley called it the worst decision he’s seen and all of the HBO broadcast team were jaw-dropping dumfounded. Max Kellerman did say that ha had checked with journalists ringside and there were some who thought the scoring was correct. LA Times Round by Round had Pacquiao winning 117-111. Fox Sports Round by Round had Pacquiao winning 119-110. Both Las Vegas Review-Journal cards and The Associated Press scored the fight in favor of Pacquiao, all 117-111. Pacquiao connected on 253 total punches – nearly 100 more than Bradley’s 159. Pacquiao also landed 190 power punches to Bradley’s 108. Ironically, the person who tried to quell the outrage most was the man who had the greatest reason to be livid. “Don’t be discouraged about boxing,” said Pacquiao. Interviewed on ESPN, Bob Arum said: ESPN’s interview of Bob Arum”When I came into the ring [after the fight], I said to Tim, ‘You did very well,’ and he said ‘I tried hard and I couldn’t beat the guy. You talk about killing boxing. Even [Bradley’s] manager [Cameron Dunkin] had it 8-4 for Pacquiao. Two people in the whole arena thought Bradley won. Unfortunately, they were judges. Pacquiao lost his WBO welterweight title after winning on the card of Jerry Roth (115-113) while losing on the cards of CJ Ross (115-113) and Duane Ford (115-113) . Ford is generally considered to be the dean of Nevada judges. The Filipino’s trainer, Freddie Roach, was dumbfounded by the decision. Even Bradley sounded surprised at the decision. “Pacquiao was a tough, tough warrior. This guy can punch, he has speed. He has all the tools,” he said. When Max Kellerman asked Pacquiao if he had won the fight, he answered: “Absolutely, yes,”. “It was a good, competitive fight,” said Bradley. “Every round was pretty close. Pacquiao won some of the early rounds. I controlled the later rounds with my jab. I need to go home and review the tape. (Reuters) – The crowd fell into silence for seconds, some wept unabashedly as they stared quietly at a giant screen in a Manila public park after Manny Pacquiao lost his WBO welterweight crown on a controversial split decision on Saturday. Filipinos in cinemas, hotels, public parks and even army bases across the Philippines were shocked, too numbed to react as Pacquiao, winner of eight world boxing divisions, tasted his first defeat since March 2005. American Timothy Bradley ended Pacquiao’s 15-match win streak in the ring, but many Filipinos found it difficult to accept after a fight Pacquiao largely dominated. “I’m so devastated,” basketball coach Charles Tiu, who watched the fight with his family and friends at a bar, told Reuters. People at the bar were stunned by the decision. They were speechless for a moment but there was no big simultaneous outcry. “I’m shocked and disappointed,” Gina Tubo, a 42-year-old mother, said, wiping tears from her eyes. Pacquiao was convinced he had done won the fight as the Las Vegas crowd booed the decision, which triggered criticism in the boxing world. There was also frustration etched on the faces of hundreds of soldiers who watched the fight at army bases across the country. Filipinos stood behind their Pacquiao, who was immediately offered a rematch by Bradley. “Manny will remain and will always be our champion,” army spokesman Colonel Arnulfo Marcelo Burgos said of Pacquiao, a lieutenant-colonel in the reserve force. “God may have other plans for him” Tubo added of Pacquiao, a congressman and widely regarded as the world’s best pound-for-pound fighter. Manila’s streets were deserted before and during the fight as Filipinos were glued to the television. Police authorities have said the crime rates drop every time Pacquiao enters the ring. That fight was a joke! Crooks! Crystal clear the fight was fixed -and why that didn’t surprise me? -because is Las Vegas world, full of crooks! – Manny Pacquiao should demand an investigation. -L.A. Times revise the fight and you will see that Pacquiao landed all his punches on Bradley’s face -Bradley almost got knocked out, but he didn’t go down and Bradley didn’t even land one punch on Pacquiao’s face. -Let me say it again, the fight was fixed =maybe for a rematch? -Maybe for Billions in gambling in Las Vegas ? -We The People demand an investigation, so those crooks in Sports go to jail. “Timothy Bradley stuns Manny Pacquiao by split decision” should read “Timothy Bradley is stunned that he beat Manny Pacquiao by split decision”. He’s not even sure how he won, when he said, “I have to go and watch the tape.” Do they really believe that the public didn’t watch the same fight as they (the judges) did? This is a sorry day in boxing, when everyone watching is as stunned as Timothy, could have won by split decision when the disparity in power punches landed clearly belonged to Manny. Yes lets ask for the refund for the PPV this is a great idea!!! I agree about asking HBO for a refund. I am going to do my letter tonight! I applaud the people who were watching the fight at the MGM for containing themselves and for not starting a riot. Kudos to everyone who got ripoff and not react in a violent way. I hope this is the tip of the iceberg to bring this Judges to face the law!! I watched this fight from beginning to end and I am totally irritated that I paid for it. What a joke! I live 20 minutes from Palm Springs and the headlines say, “Bradley Stopd Pacquiao!” What a joke. I will never again watch a PPV event and certainly never visit those MGM crooks. If there is a rematch, I hope no one shows up. Imagine if those bastards have a rematch and no one buys tickets or shows up. It would be my dream come true…what a bunch of losers. Like someone said in an earlier post…corruption live. Screw you Las Vegas…shame on you MGM Grand. I think this is a greatopportunityfor theLosAngeles Times to do deep investigationinto the StateAthletic Commissiontodenouncethis atrocity this judges have committed. They think they are above the law. However, to many people and boxing experts saw what happened last night in the MGM. If the Media including the LA times are not able to challenge this clearly corrupted Judges then we have lost our way, and we can forget about Boxing as a legitimate sport. Bradley? If you have any integrity at all, you will look at the tape, see the true result and surrender your belt. You didn’t earn it. It’s not yours. Even if you don’t give it to Pacquiao, it’s not yours. If you don’t give it back, then you are part of the problem too. Deny a rematch. Deny any association with this fight. You’re a hard-working very good fighter. Go back to training and look toward your next opponent. But don’t fight Pacquiao again. You are not champion and you know it. If you are honest with yourself. If your team is honest. Otherwise, all you did was find a $100 bill on the sidewalk and take it when it never belonged to you in the first place. Enjoy it. Because It’s already fading away before you can wrap your hands around it. What a joke! No wonder why boxing is dead. It’s fixed and it couldn’t be more obvious than now! Even Bradley’s own wife and team thought he lost. CJ Ross and Duane Ford should be investigated and held accountable for their inconceivable decisions; they should be banned from boxing forever! It’s a shame two men could render the poorest decision in boxing history and produce such an injustice to fighters and fans. Boxing will not recover from this embarrassment that CJ Ross and Duane Ford are solely responsible for. I watched the entire fight and it was a terrific battle that Pacquiao dominated! I guess in the end, money is the ultimate motivator and I don’t believe there is any exception here. I will not pay to see a rematch of a fight that was clearly decided. Just give me Mayweather vs. Pacquiao already! I don’t think anyone was more surprised than Timothy Bradley when he was announced the winner of this fight. When asked about it, he didn’t say he won. He said he’d have to watch the tape. He didn’t even know how he won. THE FBI SHOULD INVESTIGATE THE JUDGES!! REVIEW THE FIGHT!! CAUSE LAter they gonna twist it again. The TRUE winner could just lost the fight because of the judges? IT’s not worth to watch the fight anymore IF they can just do it by MAGIC!!! It was really stunning decision, even Bradley’s wife expression surprised by the decision. Analysis on this was the judges had big pay day from vegas betting influence. If Pacquiao wins vegas lose, but if Bradley wins they make millions or billions who bet for Manny and they made it happened. Nevada should investigate on this matter even the federal government should make action on this. Corruption was done live on TV, so bothering and authority should put these judges in jail and all those who were involve in this matter. We the americans should keep integrity in our sports world and bring corrupts to jail. Bradley should have honor and integrity as a boxer to know who the crown goes to and rematch and prove himself he is worthy of the belt not bought for him. Boxing is such a joke, and the results of this fight prove it. It appears that there is no way to get unbiased judging. Manny clearly won this fight and got jobbed. Boxing is FIXED! Let’s understand how gambling works: On this fight, you had to risk $400 to win $100 on Pacquiao, it’s a -400 betting line. Billions of dollars are bet on these fights. There are people who risked $20,000 to win $5,000 and there were people who risked $100,000 to win $25,000. BUT that -400 was nearly -450 until RIGHT BEFORE THE FIGHT. Now when betting lines move aggressively like this, it’s because insiders (i.e. Handicappers) know something very critical that WE DON’T. The big bookies taking these bets, like BODOG, BETUS, etc. not to mention the good ol’ MGM GRAND, who rake-in around 5 to 10 Million EACH in bets OVERWHELMINGLY on Pacquiao absolutely DO NOT WANT TO PAY all those winning Pacquiao tickets. So what do they do? First they universally make that -450 a little less expensive to bet on Pacquiao, by making it a nice whole number like lets say -400. Now remember they aren’t losing money by allowing bettors take less of a risk because these BILLION DOLLAR sportsbooks ALL KNOW what’s going to be the outcome. Now this may sound like some wild conspiracy theory, but before you think that, you may want to consider what Bradley’s trainer, Joel Diaz said to Bradley before round 10 “Just last two more rounds and you’re going to make history”. Huh? He was LOSING, BADLY. But I think he knew something us poor little boxing fans didn’t know. THE BLEEPING FIX WAS ON! I found that statement by Joel Diaz strange too. I was wondering why he wasn’t instead, telling Bradley “you got to knock him out to win this fight, so lets get busy”. But now that ive read your comment, I no longer find it strange. I’m a gambling man, and I agree with some of your points, I think you’re overthinking it. Two fights are better than one. Rematch. One of THEE most obvious sign’s of corruption in boxing yet! Bradley won one, ..maybe two rounds and that was IT… When it happens as obvious as this fight, their showing the fans they dont give a f**k what you think, its about the money and the money ONLY! They are going to line their pockets with the blue print of boxing curruption they’ve designed no matter what. If it can happen like this, there is No Way Floyd is taking a chance on actually winning a fight on style and points, only to be robbed by crooked boxing politics. I think even Manny understands that now. I have been to about 20 fights in MgM and saw Manny a few times , even thought Marquez did beat Manny but was not able to pull off this fight! So I did ppv and I will say that Vegas has lost me as a Boxing fan and moreso as client there. I couldn’t be more shocked than I have been tonite. If Vegas does not open an investigation and have Judges watch fight and score in with counsel present and reverse decision I know for a FACT that many people like myself and my friends who visit Vegas 4-5 times a year for fights have completely lost our appetite to do so. Such a shame for tourism to Vegas. This game was rigged, if these judges, boxing industry, etc allow Pacquiao to lose so that they could somehow profit, I will not support nor watch another one of these lightweight fights. What’s the point of watching if they could twist someone to win, when they should have lost. It’s a waste of time, heart and robs the joy of the game because it’s dishonest and corrupt. How can Pacquiao win 9 rounds, and Bradley 3 for it to equal Bradley as the winner. That’s simple addition. It’s ridiculous! I hope Pacquiao doesn’t stoop down to their level and do a rematch, don’t waste your energy or time with crap like this. BRADLEY… Ask yourself this: Do you seriously believe your earned that belt?! If the answer is yes… How much did you pay? 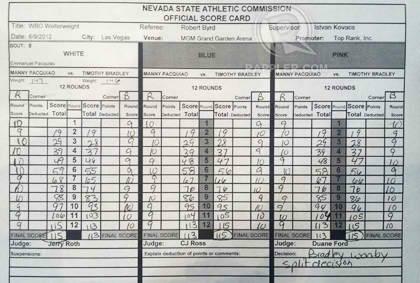 All three judges should be fired, even the one who scored Manny for the win; the most absurd decision I’ve seen in the history of the sport. Saw Jinkee totally sad about her hubby’s loss, but Monica Bradley was going bananas. I found more info and pics about Bradley’s wife Monica here http://fandaily.info/?p=24693 in case you are interested! This is why no one watches boxing anymore!!! drawing…. went to the current David Hockney exhibition at the Royal Academy in London…the man is the reason I went to art college about a hundred years ago but my creativity is channeled mainly in writing now….went out and bought a pen immiediately so am trying to get back in the habit of drawing!! That’s a smart answer to a dilcffuit question.